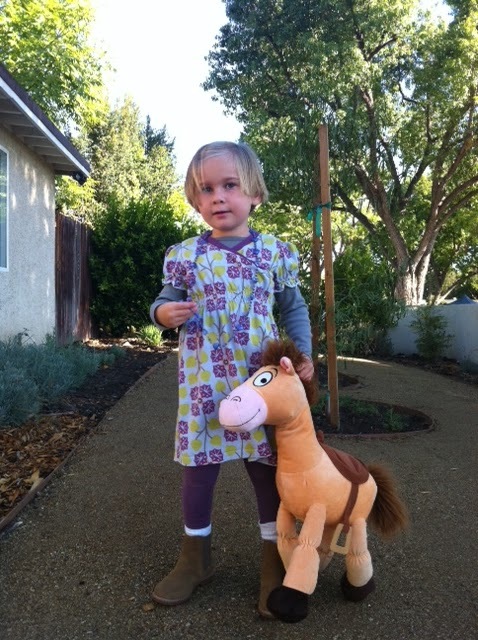 Once upon a time I had a daughter who never said a peep about what I dressed her in. It was fantastic! When all the other daughters were voicing opinions and wearing crazy mismatched things in public, mine was always ok with her stylish and coordinated outfits. Then, slowly but surely that little girl started to develop opinions. I sense she’s always had them but only recently has she gained the wisdom to vocalize them. Yesterday it was rainy and cold. Our first real day of fall/winter. I finally got to pull out P’s winter clothes. 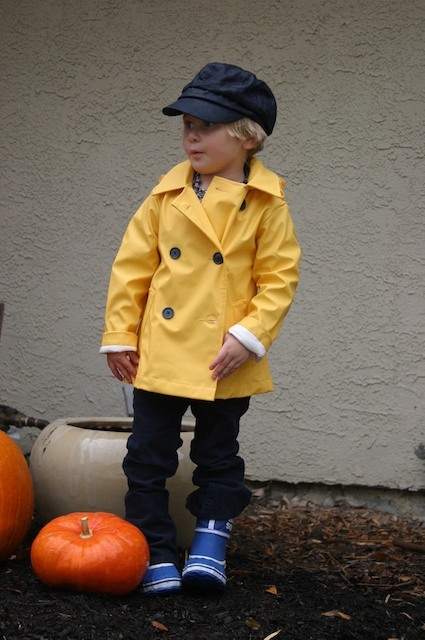 When I dressed her in navy, wide-legged cords with a cute cambray shirt she objected. “I don’t like this! I don’t like this shirt!”. I pulled out all the options that would go with her pants. She picked out a stripped blousy shirt that I must admit was a better choice than what I had picked out. I got her outer gear on reluctantly; double breasted yellow rain jacket with a hat and new,warm Sorel boots. I saw the sour face but we were running late for school. On the way to the car she says to Dave “Can I take this costume off when I get home?”!!! Costume? What costume? I had to take a picture of her when she got home because I swear one day she’ll look back at this and laugh at herself and her comment. Costume? Today’s outfit was selected the night before. I wanted to go over it with her so that the morning would go smoother. Turns out P is a girlier girl than I thought. She wants to wear dresses. She doesn’t want to wear pants. Perfect, I bought her 5 pair of cords! Now I’ll have to figure out a way for her to wear them. I’m glad I bought lots of leggings and undershirts so I can layer all her dresses for winter. Well, at least she continues to have a good sense of style. She does listens when I point out why something doesn’t go with what she’s wearing. And like I said, her choices are often better than mine. I just liked it better when it was like having a doll I got to dress up everyday. Now, someone pulled the cord on the doll and she started talking!!! Previous Previous post: The Summer She Jumped!